According to Statistics Canada, the years between 2010 and 2031 will see an accelerated rate in the aging population since this is the period when all baby boomers will have turned sixty-five. By the year 2036, between twenty-three per cent and twenty-five percent of the population will comprise of seniors aged sixty-five and over. The number of seniors by 2036 will be double the number of seniors in 2009. In the United States, there will be approximately seventy-two million older persons by the year 2030. That’s more than double the number of seniors citizens than in the year 2000. Nineteen per cent of the American population will be aged sixty-five plus by the year 2030. Globally, the percentage of senior citizens vis-a-vis the general population continues to increase. Life expectancies world-wide are rising, causing governments and other institutions to write policies that will accommodate this major demographic shift. Effective planning to address the myriad physical, medical and social needs of the senior population is prudent. Equally important is providing spiritual care for the elderly. Research shows that people of faith are better able to cope with the changes brought on by aging. By extension, caregivers with a strong spiritual life are better able to support people in this stage of life. 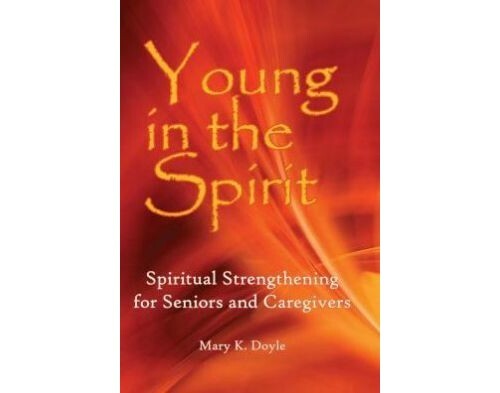 In her new book, Young in the Spirit: Spiritual Strengthening for Seniors and Caregivers, author Mary K. Doyle “explores the impact of spirituality on aging and caregiving as well as how to strengthen our faith during our golden years.” She draws from personal experience as well as her professional background as a writer who has written hundreds of articles for newspapers and magazines including The Chicago Tribune, Press Publications and Lerner-Pulitzer Publications. Mary K. Doyle holds a Master’s Degree in Pastoral Theology and this is evident in the way she presents this subject. Mary explores the topic of spirituality from two perspectives: the senior citizen who is coping with the challenges of advancing age and the caregiver who addresses the needs of the elderly. She highlights research which shows that seniors who have a faith life are better able to cope with the many changes of increased age. Furthermore, as a caregiver to a loved one with Alzheimer’s Disease, she acknowledges that “God’s plan for him having this illness has as much to do with me as it does with him” and that strengthening her own faith is important. As a registered nurse whose area of expertise addresses the needs of our elderly brothers and sisters, I greatly appreciate Mary’s insights and suggestions for achieving and maintaining a dynamic faith life in the senior years. In my work, I see how faith (or the lack of it) impacts my patients’ ability to cope with illness and loss. I also welcome the book’s suggestions for helping me nurture my own spirituality. As a caregiver both professionally and personally to a father who lived with Parkinson’s Disease for five years and a mother who has dementia, I understand that my faith is a necessary component for effective, compassionate, holistic care. We are or will be affected by the boom in the aging population. How we approach this reality depends on our attitudes and spiritual beliefs. Young in the Spirit: Spiritual Strengthening for Seniors and Caregivers is a valuable resource for everyone. It provides seniors and their caregivers with the spiritual tools that help us to successfully journey together through this challenging but beautiful stage of life.